Qatar 2022 World Cup: When will tournament take place? Football's movers and shakers met in Zurich on Monday to discuss the 2022 World Cup in Qatar. But are we any closer to finding out at what time of year the tournament will be played? 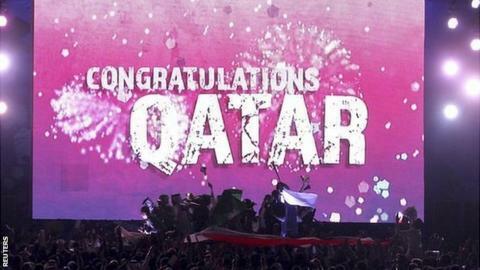 In 2010, Qatar stunned the football world by winning the right to stage the 2022 World Cup. It fought off competition from the United States, Australia, Japan and South Korea to land the biggest football contest on the planet. But almost immediately, key Fifa voters, including Franz Beckenbauer and Michel Platini, raised the prospect of moving the tournament from its traditional June/July slot to avoid the high summer temperatures in Qatar. Those calls intensified, prompting a unilateral attempt by Fifa president Sepp Blatter to shift the World Cup from its June and July schedule. He was reined in by the regional confederations, who demanded they be consulted, along with the leagues, clubs and broadcasters. So a taskforce headed by Shaikh Salman, the head of the Asian Football Confederation and a Fifa vice-president, was formed in October 2013. In the year since, Salman has travelled the world to speak with individuals and organisations who would be affected by any change in date. Only in the past few weeks has the real negotiating started in earnest. Why weren't heat concerns raised earlier? Before Qatar won the bid, Fifa was warned about - but seemingly ignored - the heat issues in a technical report that described a summer tournament as "high risk". Now, with talks over when the tournament can be played continuing, Fifa medical chief Jiri Dvorak briefed members of the taskforce on the "highly critical risk" to players, officials and fans attending a World Cup in Qatar between June and August. During the bidding process, Qatar countered fears about the summer temperatures, which regularly exceed 40 degrees Celsius, through intense lobbying of Fifa voters. That was followed by a dazzling bid presentation that showcased how pioneering cooling technologies would air-condition stadiums, fan zones and training grounds to 23 degrees Celsius. Those plans are still in place and Qatar organisers are keen to deliver on their pledges no matter when the tournament is played. They insist they are happy to host the World Cup at any time of year, including the northern hemisphere summer, but its chief executive, Hassan Al Thawadi, said winter would offer an "ideal" time. Two winter options - January/February or November/December - have emerged as the most likely, while there is a possible compromise of May, but there is no clear agreement between the parties. The European Club Association (ECA), which represents more than 200 of the continent's biggest teams, suggested playing the 2022 tournament between 28 April and 29 May. However, the Muslim holy month of Ramadan, which is set to fall in April and early May that year, is seen by many as a major obstacle. During Ramadan, eating and drinking in public during daylight hours is forbidden in Qatar, while many government offices and businesses also operate on substantially reduced working hours. Additionally, the ECA plan calls for domestic cup competitions, such as the FA Cup in England, to be concluded in June once the World Cup has finished. That has not gone down well with national associations. Separately, the Association of European Professional Football Leagues (EPFL), which counts the Premier League, Spain's La Liga and the German Bundesliga among its members, suggests the World Cup starting in late May and ending in June. BBC Sport understands both the ECA and the EPFL will now work together to produce a new plan for May that answers the main criticisms levelled against their current proposals. Fifa has a long-held preference for November/December, although North American and South American confederations are against those dates because their domestic seasons conclude around this time. Uefa put forward a proposal for January/February 2023, but that was swiftly dismissed by Fifa general secretary Jerome Valcke, who insisted the tournament was contracted to be played in 2022. Uefa would prefer January/February 2022 because a November tournament would impact on the Champions League group stages. On Wednesday, Uefa president Michel Platini ruled out a World Cup between April and September. That will disappoint the big European leagues, including the Premier League, as they want a May tournament. They want to see every option for a summer tournament exhausted, and are angry because they feel they are having to absorb the repercussions of Fifa's actions. A January/February competition would be deeply unpopular with the Premier League given it would put a hole in the schedules of broadcast partners and disrupt the title-run in. Other European leagues could be more willing to accept January/February. Many already employ a winter break, which could be delayed to accommodate the World Cup. If a winter tournament is staged, many European leagues would prefer one as early in the season as possible. September/October has been mentioned, but this is not an option for the Fifa taskforce. What are the major stumbling blocks? Of the three options still under consideration, Fifa is believed to want November/December for several reasons. Firstly, Blatter has an agreement with the International Olympic Committee that there will be no clash with the 2022 Winter Olympics, which are expected to take place in January and February. Perhaps more importantly, a January/February World Cup could force Fifa to take a significant commercial hit. US broadcaster Fox, which will show the 2018 and 2022 World Cups, is reported to have paid $425m on the understanding that both tournaments are held in the summer. That is because Fox also broadcasts the NFL, which is midway through its season in November and building up to the Super Bowl in early February. If the tournament goes ahead in the first two months of the year, expect Fox and other media companies to demand financial recompense. One senior figure at the negotiating table, speaking to the BBC on condition of anonymity, said that at this stage he "wouldn't like to call which way it would go". The November/December date which Fifa is so keen on is said to have received scant support at Monday's meeting. However, on the basis that what Fifa wants, Fifa normally gets - and with the International Olympic Committee and commercial considerations factored in - then a tournament in November/December must still be considered the probable outcome. There will be those who make very strong arguments for January/February and it should not be ruled out yet. When will a final decision be made? The taskforce has been asked to advise Fifa's ruling executive committee, which is headed by Blatter, of its preferred option by March 2015. It will then, in theory, rubber stamp the recommendation. But there is no clear guidance on how the taskforce will arrive at its conclusion and a further meeting between all parties is expected in January.